It’s not often I permit photographs with people in them to appear on BPotD, but exceptions are occasionally warranted – in this case, for scale. Today’s photograph is courtesy of Miguel Rodrigues (the photographer) and Pedro Nuno Teixeira Santos (pictured) of Portugal. Thank you to both of you once again! Pedro sent along the image and these measurements (by Miguel) of the tree: the height is 19m (62 ft.), the circumference of the trunk is 5.91m (19ft.) and the highest measured diameter of the crown is 37m (121 ft.). As Pedro succinctly states: “It’s an amazing tree… one of the biggest cork oaks I have ever seen.”. Pedro has also written about this plant (accompanied by more photographs) in Sua majestade on the weblog, A sombra verde. Quercus suber, or cork oak, is well-known for the renewable resource it provides: cork. The thick, rugged outer layer of bark can be harvested multiple times over the life of the tree, the first time at 25 years of age and then after every nine to twelve years. The individual in today’s photograph appears to have different sections of it harvested in different years, with the reddish area on the right being the most recent site of cork collection. From some trees, the harvest can be one tonne of cork; considering its density, that’s an impressive volume of cork. The cork produced by Quercus suber is high in the waxy substance known as suberin. This, in addition to the quantity of bark produced, provides its most-desirable qualities: elasticity, near-impermeability, and low-density. Wikipedia covers the uses of cork: bottle stoppers, fishing floats and buoys, musical instrument-making, floor tiles and concrete-cork composite materials. If you are interested in the harvesting and production process of wine corks, read natural cork production from one of the cork manufacturers. 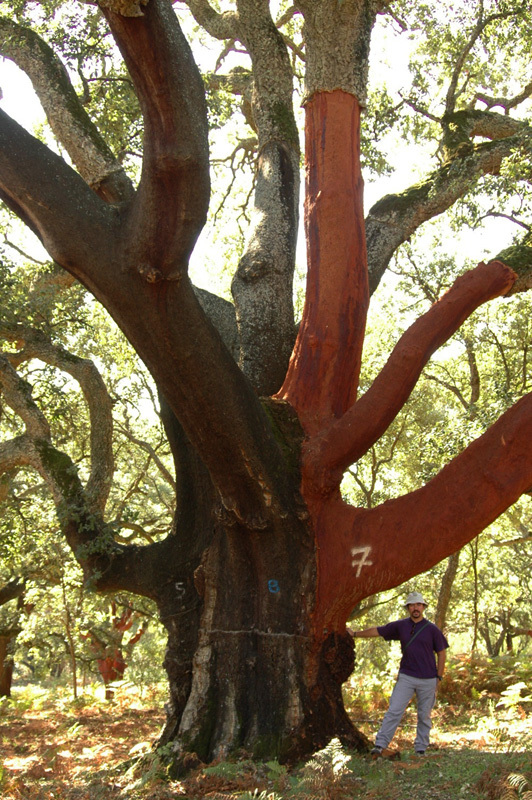 An excellent article on Quercus suber is available from ecology.info: Cork Oak (Quercus suber): The Roles of its Bark by Juli G. Pausas of the Centro de Estudios Ambientales del Mediteráneo in Valencia, Spain. Quercus suber is native to southwestern Europe and northern Africa (in addition to where it grows naturally, it is also cultivated throughout the region; Portugal is responsible for half of the production). The Plants for a Future Database details a few non-cork uses of the species. If you’d like more photographs, visit Friedrich Lohmüller’s page on Quercus. I googled “cork alternatives” and it seems that cork is better environmental choice than plastic for wine bottle closures. It makes tending cork oak forests worthwhile ($). And therefore the cork oak ecosystem is less at risk. I learn something everyday- often from BPotD! Simply amazing! I’m sending this to all my orchid friends, as cork oak is in high demand in the orchid growing world as a substrate on which to mount epiphytic orchids. 8th edition hardbound Hillier Manual of Trees & Shrubs copyrighted 2002. In North America large cork oaks may be seen in California. There are comparatively small ones as far north as Seattle, where hardest winters may do some damage. What interesting information and a great photo! I had wondered about cork production and what it did to the trees. Thanks Miguel, Pedro, and Daniel. Ditto to Eva – always try to get wine with real cork stoppers. Google ‘dehesas’ for more info on the very valuable wildlife habitat where Cork Oaks grow. It is possible to recycle cork. In Portugal we have some industries that recycle cork but we don´t have a national system to collect wine cork. I’m a teacher and I’m promoting a similar project in my school with the same purpose: prevent wine cork from ending on normal garbage and obtain money (from recycling) to buy and plant more cork oaks. I am just about ready to give up drinking my favourite Italian and Hungarian red wines as they almost all switched to screw top a sign of inferior swill or fake plastic corks. Somehow red wine isnt red wine if its not preceded by corkscrew calisthenics and airing and carving the cork for rebottling. I was wondering what happened to the cork oaks of the world or is it some idiotic euro regulation. I think there is a trend toward the fake plastic corks for the sake of consistency; one never gets a “corked” or spoiled bottle of wine. Cost might also be a factor, I guess – anything that involves manual labour seems to have a tough time competing against mass production. How awesome. I had no idea….about the cork trees I mean. I enjoy this site sooo much. I intend to read the links. The tree is magnificent.So much too learn so little time. Thankyou for sharing. I guess the numbers refer to the year of harvesting? I observed this tree at home in the office and at camp and the colours of the fresh debarked cambium, I guess they leave that, varied from a deep red to a greyish maroon to almost black. In the case of the fern pale faded yellowish green to harsh poison green to a pleasant meadow green. As in each case the same picture was sent it must be a deficiency of the receiving computer unit. The emotive effect and the aesthetic meaning in each case was widely divergent. Not to speak of scientific accuracy. We will need decades I suppose before both sending and receiving machines will have hue contrast colour tone density adjustments possible. books albums and each had totally different colors with no way of knowing the original. Here it’s easier as I can assume the fern is a normal green and the oak a moderate russet red. Can truffles grow on Cork Oaks? in your glass of wine. Turns out as I thought the propaganda about plastic corks and twisttops are hokum. They cause oxidation in one case but reduction in the other of ALL YOUR BOTTLES OF WINE not spoiling of one bottle in ten thousand as in the case of real corks but wrecking the taste of 100%. Then the websites got into CO2 content and further esoterics of oinology where I chose not to follow. As a result of these researches I will give up all my brands of not organically corked wines, if they cant be bothered I cant bother to buy them. Finally ecologically to support the natural fire resistant that turns out to be the reason for corking of the oaks as well as drought survival is the correct attitude, hundreds of thousands in Portugal Morocco Spain France Italy Brazil depend on this eco friendly industry. Same as we should support real maple syrup not fake goo we should drink real wine in real bottles corked with real corks. a friend of mine who works in the horticultural industry who was on holiday in the area noticed that people where picking the acorns of cork oaks and where eating them. To his surprise when he tasted them ,they where sweet totally diffrent to the one which grows in spain! as the one in spain are bitter Could there be a possibility of being a sub species of the genus or hybridised with an other species i.e quercus rotundifolia which are sweet acorns could i have your point of view about this? awaiting your reply !!!!! !